I was so impressed by all of the work you all did on the last lesson, great job! We have begun to familiarize ourselves with our cameras with the last exercise (Food Photo 101: First Principles), putting your hands to work on the settings and knobs and dials and such. Its ok if it still feels overwhelming because familiarity through practice is the only way to master these things. For me, as I put this course together, I feel this tension between getting people started on basics and helping people keep motivated by seeing improvement in their photos immediately. Today’s lesson should yield some positive changes for you. 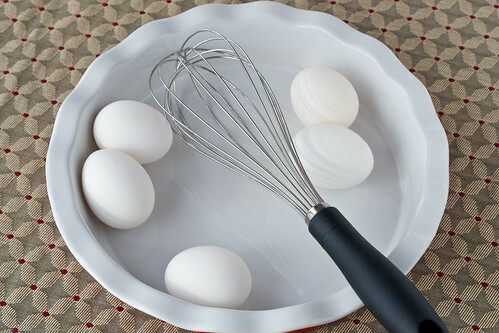 So, in today’s second Food Photo 101 class we are taking a break from the camera-geek-speak! We are also not going to be camera-specific. These ideas are common to any format, be it pin-hole, digicam, DSLR, Medium Format, Large Format, etc. We are going to talk about how to harness the light we need to make good photos. I like to visualize the whole process of playing with light as if I am redirecting streams and rivers of photons. With time and practice, you will see how these streams and rivers can work both for and against the beauty of your food. Our goal is to harness or direct photons onto and around your subject in a way that is appealing in food photography (may not be appealing in portrait or product photography). We will go though various examples that hint at how to do this and then I am going to unleash you all to do it at home and report back! Rest assured, there are many companies that make nifty do-dads that modify light for exorbitant prices. Another goal I have is to encourage a low-tech do-it-yourself approach to lighting. Because that means more of us can afford it. Going DIY, we learn and experiment with a creative spirit, we feel empowered to make any sort of contraption that we might need to get the job done. You won’t be stifled by the lack of some expensive gadget that hasn’t been commercialized and sold at high prices in some 3 foot thick catalog. In this case, I can speak from experience because I try to use low-tech whenever I can, as you will be able to see in today’s post. In the photo above you can see some of the the various objects I use to bend, modify and cancel the light in and around my subject. You can see large foam-core boards and a self-standing science fair folding background that is very helpful. 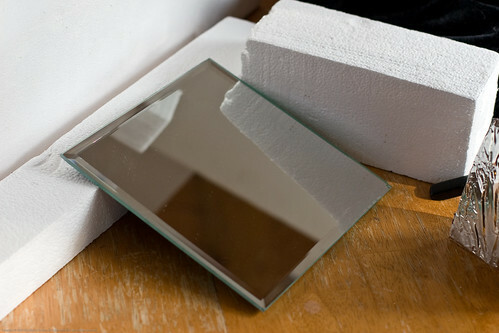 There are mirrors and styrofoam blocks. I love to use pure white styrofoam that I have saved from packages. They are lightweight, easy to modify, and easy to hold with one hand while shooting with the other. They also reflect an excellent quality of white light. 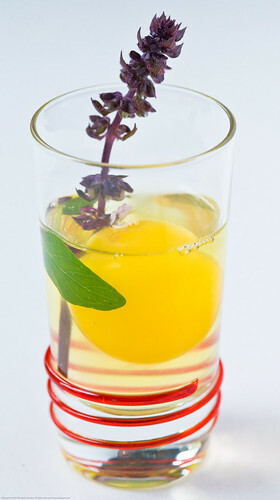 If you put it near a food item that has a really dominant color, that color will bounce back too. Be aware of that when you are setting up any sort of bounce. There are no end of ways of rigging little mylar bounce flags. I tape the mylar onto cardboard and then rig some sort of stand on the back. These have been through a lot! The shared quality these things possess is that they bounce (or absorb) light. Not all bounced light is equal. 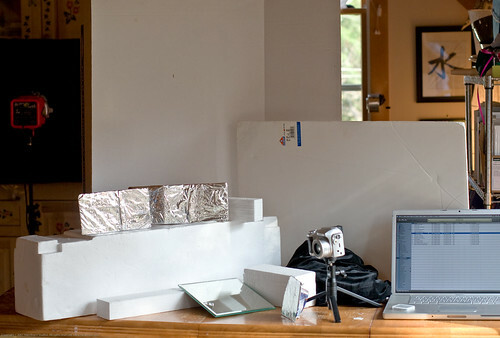 The styrofoam and other white materials that are not shiny will bounce a diffuse light. The light will be soft because it is composed of a group of photons that are bouncing in all sorts of directions. 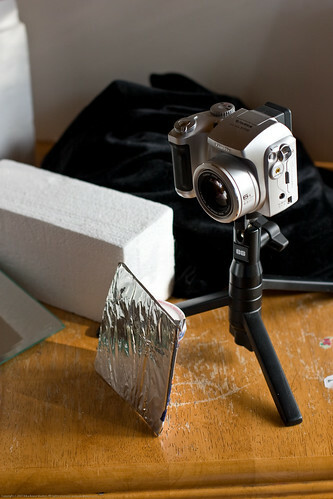 If you use a shiny bounce like foil, mylar, or a mirror, you will get a different flavor of light. These will give you a specular reflection. See the glossary or those links for details! In practical terms, the shiny surfaces will give you some intense focused light that you can direct onto a particular part of your subject. I like to use it on the front darkish part of the food if the light is coming from the back. So, to re-iterate, today’s work will be on getting your subject lit with beautiful light that brings out the best of it’s qualities. For these projects you will need to look around your house or at a cheap art store for relatively lightweight light modifying materials. Homework Task One: Make your own bouncing wonders and then take a photo of them, showing off any neato-keeno details that we all can learn from. In the image below you can see a pie plate with a few eggs and some slices of bread. The light was coming in through a clear window on the left. I placed some white styrofoam on the right to bounce the window light back onto the subject. It seemed like things were a bit flat with the diffuse light so I propped a mirror up against the foam near the subject. You can see a bit of the mirror on the right edge. My goal was to try to get a bit of light into the inner bottom parts of the pie plate and to try to get some more light on the bread. 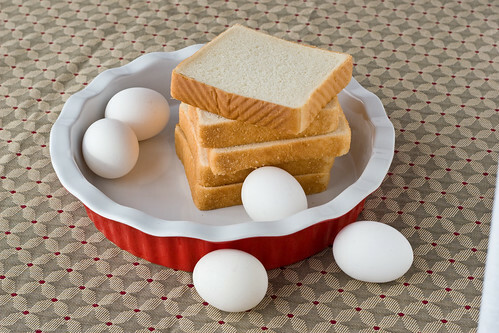 You can see that there is more light spilling onto the eggs on the left, inside the pie plate and the bread crusts on the right are brighter and somewhat warmer. I have included a set-up for that shot below. You can see how the styrofoam and the mirror were set up. 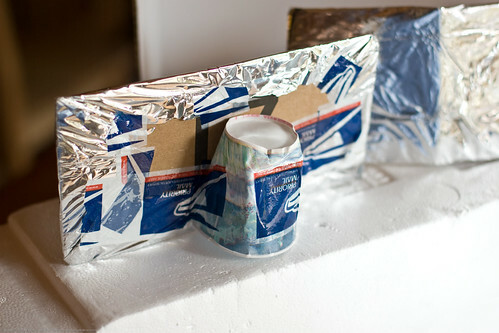 You can step beyond the white styrofoam and use other colors to modify the lighting in your photo. You can use gold foils, you can use bubble wrap or lace or other semi-transparent veils. There is no limit beyond your imagination. When I am feeling like changing things up, I sometimes use a black velvet background behind my subject. 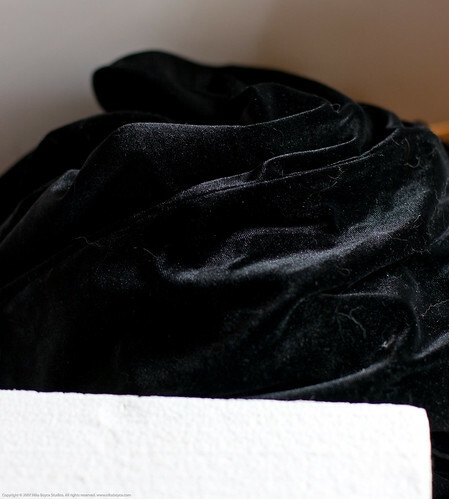 I have a black velvet dress which is excellent for using as a backdrop. The problem with MY velvet is that one or more of my 5 cats is utterly obsessed with sleeping and shedding on this dress. Photoshopping out any hairs or dust on the black background is very easy because the black is almost perfect so photo-repairs go really fast. When you change the background to a deep unreflective black, it does some interesting things to what might be an ordinary object. 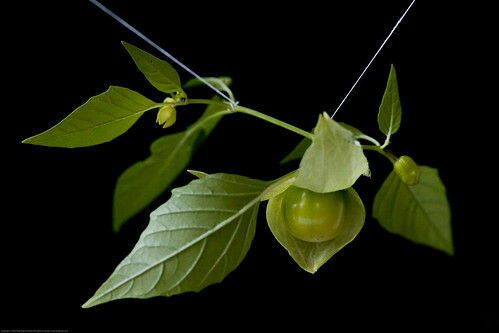 Here we can see a still life of a tomatillo on it’s branch from my garden. It feels really moody and textural. The shininess of the tomatillo becomes more luminous somehow and really draws you in. The veins of the the leaves are well delineated. The way I shot this was by rigging it up so that I could show what it might look like while still on the plant. Here you can see the subject with the suspending strings, before the strings were photoshopped out. 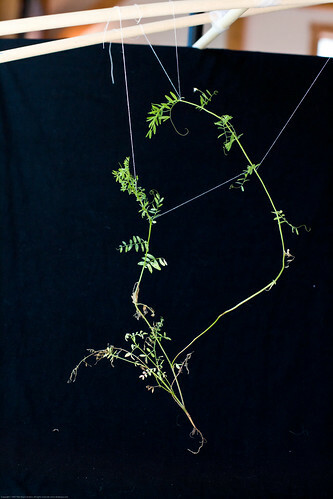 You can see some of the setup here for a different shoot (a black beluga lentil plant). The subject is hanging from some rigging in front of black velvet. 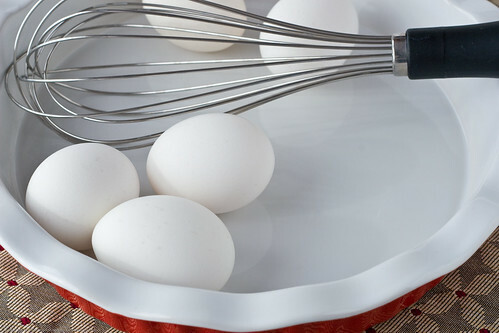 Below, you can see a comparison of the same subject, a raw egg in a shot glass, set on a black background and a white background. Homework Task Three: Find a simple food, maybe a raw vegetable or fruit, and shoot it on a black background and then on a white background. Do not forget to also use a bounce to brighten up areas that get too dark for you. Great! You have several tasks to get to for today. I hope you get creative and really observe how the lighting changes when you do these various modifications. 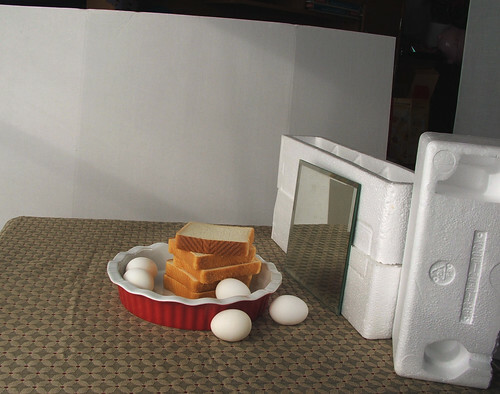 Homework Task Two: Prepare or assemble a food that you have had difficulty with before and shoot various test shots with your styrofoam and mirrors. Share your images with us. Its ALL about the photons. Experiment and nudge your bouncers until you find the light you need. Thanks for sharing all the information! Sometimes I think I should try to improve in a more structured way but didn’t really know how – that’s the way to go! Eva: We are glad to have you! Its good to have structure, its also good to brainstorm – free associating sessions when you just try this and that … dont ever think one solution fits all cuz it wont! Cant wait to see what you come up with. Your style is quite lovely and making me hungry for sure. Nika I love all the ways you work at reflecting light! My problem is that I am generally trying to photograph at three different areas-countertop, stove top and sink, in a room facing west! Any suggestions would be appreciated! Yeah, you shoot in some tough locations. My kitchen faces north with very little light and these super yellow halogen spots from right above. I have tried so many times to get a good shot in my kitchen but to no avail. I think you do an excellent job in those hard to shoot areas. I hate to suggest expensive things but you MIGHT consider getting an alien bees strobe with a softbox that is small and which you can set up (you would need to experiment) in and around your food shooting areas. You could have a light stand with a boom to get the softbox above and off to the side of your work. I cant remember if you have a camera that is P&S or DSLR – tell me which it is and I will see if you can even have it talk to a strobe. I use a Cannon A640. I’ve never heard of an alien bees strobe with a soft box. (Are you speaking in alien tongue??? :)) I’ll go look it up on google. Your light modifier photograph in the Why? section has illuminated (couldn’t resist) more on photography than anything else I have read. I have learnt that those wonderfully lit shot I see don’t just happen, they are worked on. Thanks for the course.